Xperia X8 is a cute, handy phone from Sony Ericsson. It ships with a customized version of Android 1.6 and it can be easily upgraded to 2.1 with the official updates. However, no further upgrade is planned by SE for the newest releases of Android and the “Timescape” interface customization on the X8 is terrible. If you find that these are quite good reasons to try to install another version of Android, keep reading. The first problem is to choose a trusted channel for documentation and downloads. What we are going to do is to install a Custom ROM, which is basically an aftermarket custom upgrade for the phone; while Google documentation for android developers is quite good and structured, this is not also true when dealing with custom roms. Custom ROMs are fully standalone versions of the OS, customized with a bundle of apps and services: they are (of course) device-dependent, the documentation is located here and there and it is often hard to read for most human beings. After some search i decided to start from Android Froyo 2.2, with an “Hackdroid” rom, which is a Cyanogen MOD ROM (CM6) with the Sense theme, packed for the Xperia X8 by Racht (XDA Developers). Since then I have been using 2.2.5 CM Floyo 0.25 [ june 5, 2011], and FroyoBread v023b. FroyoBread v023b FINAL is now considered the most stable 2.2 (Froyo) rom in town. It worths a try: [ROM] FroyoBread | v023b FINAL | 27-07-11. All the process can be summarized in four main steps. Links to more specific tutorials are provided below. there is always a “before you begin” step that is: backup. Backup everything that you may need. My suggestion is to backup: phone contacts (use an app or a sync tool), sms (i forgot to do that! ), email, applications and settings (this is also covered in step 3), any important file or data on your sd card. Disclaimer 1: all the information contained in this post is referred to the Xperia X8 [E15i] with the latest, official, Android 2.1 firmware [Eclair 2.1.1.A.0.6]. Disclaimer 2: any operation that you may perform is at your own risk . You may void your warranty and “brick” your phone. Turn debugging mode on, on X8 Settings> Applications> Development Debugging USB checkbox. Connect the phone via usb (do not mount); launch the software and press “root”. If it works you’re done. Install the Busybox GPL app from the Android Market. Install also a root file manager if you don’t have one. Newest versions of Android will let you install application on the SD card if the phone is rooted. This may require partitioning the SDcard. If you are on Linux, use a tool like GParted: make an additional partition of 500 mb or less. Then use an app like link2sd to save to the SD all the apps that you want to keep. [UPDATE: sept 16] At the moment of writing, Floyo 2.2 is still considered one of the most stable ROMs out. It is fast and fully functional. On the other side, Gingerbread 2.3 grew big and strong and now it’s a very good option for an everyday use (not only for tinkering). I would still suggest Froyo 2.2 as a best choice for beginners and as a smart solution on the oldest/cheapest phones. But if one wants to go a step further, here’s a great thread on the XDA Forum, with facts and features of all the new 2.3 roms: Guide To Roms Xperia X8. Whati is baseband: The baseband is the subsystem of the phone that controls radio communications. It’s a chipset on the phone that directly controls cellular hardware and communications with cell towers. Guide To Roms Xperia X8. Post updated! 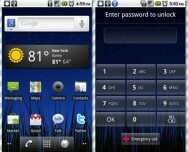 I also recommend this thread for Gingerbread on xperia x8 http://forum.xda-developers.com/showthread.php?t=1222348. And remember: when upgrading between versions (es from 2.2. to 2.3), a full wipe is required! I’m just wondering, when you install this update, will every single thing from 2.1 will be transferred to the 2.2 Froyo (as in textmessages, phone contacts, preinstalled apps/games, user info etc)? If not, is there a way to do this? Usually it is better to make a full wipe between major versions eg from 2.1 to 2.2. In this case user data and apps are not transferred. I suggest to backup everything that you may need: SD card, contacts, messages and so on. For contacts there are plenty of methods: i’m now using Funambol sync but you can also export everything to VCF files with “Import Contacts” which is good because you always have the phisical files on your pc (http://www.stilemosso.it/2011/05/my-favourite-android-apps/), or use the Google backup service. I downloaded again all rhe apps that i wanted to use.